Today we at Kidliterati are pleased to welcome a wonderful guest post from Margarita Engle, award-winning children books author. I have always been surprised by the scarcity of bilingual children’s books and Spanish editions of children’s books by Latinos. Every decade or so, a change occurs, and for a brief period, bilingual and Spanish editions become available, but with the exception of a few specialized small presses, the publishing experiments are usually thought of as failures in terms of sales figures. The status quo then returns, with only bestsellers by non-Latinos translated into Spanish. This is especially true of books for middle grade children. The need for bilingual and Spanish editions is directly related to family literacy. How can members of different generations read and discuss the same books, without availability in both languages? My Cuban mother learned to speak and read English when I was little, but my grandmother never mastered the language of her second country. I communicated with her in Spanish, but my children used a combination of gestures and Spanglish. She was not able to read the books they loved. That is why 2017 is such a special year for me. 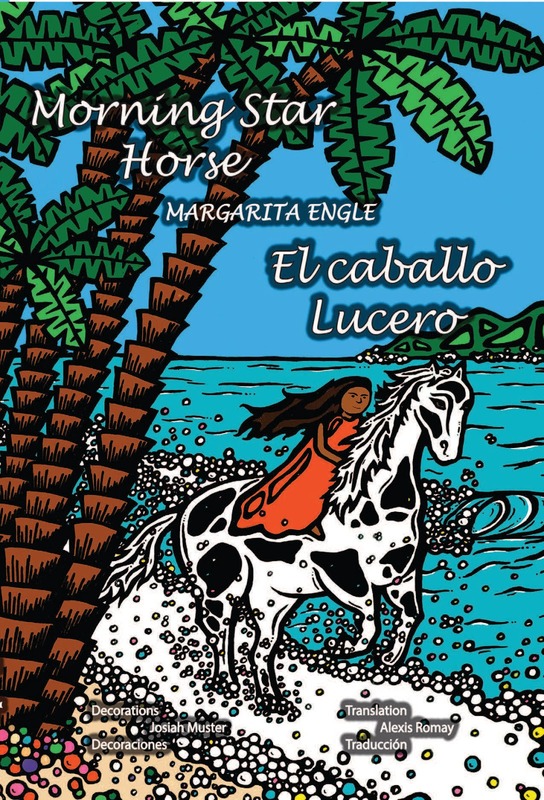 An innovative new small press, The Horizon Bound imprint of HBE Publishing, is releasing my middle grade historical fantasy, Morning Star Horse/El caballo Lucero, in a choice of three formats: English, Spanish, or bilingual. A beautiful translation by Alexis Romay makes the Spanish and bilingual editions into exceptional works of art, especially when combined with unique illustrations that include a flipbook effect. When I say historical fantasy, I’m really talking about magic realism. In Spanish, the term is lo real maravilloso, marvelous reality, a much more precise description of a style in which, instead of sci-fi world building, everything is ordinary, with the exception of one marvelous element. I wrote Morning Star Horse after learning about a real situation so surrealistic that it seemed hard to believe. In essence, I added a magical horse to make true history seem more plausible, from a child’s eye point of view. Without any spoilers, here is the basis for this verse novel: a few years after the Spanish-American war, Cuban orphans known as the Raja Yoga Cuban Kids were taken to an unusual school in California, where they were taught yoga and gardening along with music, art, drama, literature, and science. It was as if the hippie movement had begun at the start of the twentieth century, instead of in the ‘60s. I hope that brief introduction makes you want to read more! Margarita Engle is the Cuban-American author of verse novels such as The Surrender Tree, a Newbery Honor winner, and The Lightning Dreamer, a PEN USA Award winner. Her verse memoir, Enchanted Air, received the Pura Belpré Award, Golden Kite Award, Walter Dean Myers Honor, and Lee Bennett Hopkins Poetry Award, among others. Margarita’s books have received multiple Pura Belpré, Américas, International Latino, and Jane Addams Awards and Honors, the Claudia Lewis Poetry Award, and an International Reading Association Award. Her most recent picture book, Drum Dream Girl, received the Charlotte Zolotow Award for best picture book text. 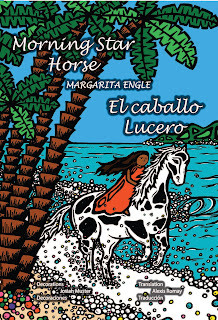 Margarita’s newest historical verse novels are Lion Island, Cuba’s Warrior of Words (Atheneum) and Morning Star Horse/El caballo Lucero (HBE Publishing). She lives in central California, where she enjoys helping her husband train his wilderness search and rescue dog. Please visit Margarita's website at www.margaritaengle.com.